Zimbabwe and Papua New Guinea (PNG) will meet on Saturday (13 January) at 10.30am at Lincoln No. 3 to kick off their 2018 ICC Under 19 Cricket World Cup campaigns, Zimbabwe having qualified by virtue of their Full Member status, and PNG by winning the ICC East Asia-Pacific Under 19 World Cup Qualifier. Both sides come into this tournament on the back of warm-up losses, but they were contrasting in nature, with PNG losing to West Indies by seven wickets and with more than 25 overs to spare, while Zimbabwe pushed New Zealand hard, eventually succumbing by 52 runs. Prior to that, PNG came through their qualifying tournament unbeaten, while Zimbabwe lost seven of their nine Under 19 ODIs in 2017. The ICC East Asia-Pacific Under 19 World Cup Qualifier was a tough one for batsman – in 11 completed games, there were only two fifty-plus scores. In this context, the exploits of Igo Mahuru stood out especially. He averaged 42.5 with a high score of 98, and his 170 runs were far and away the best in the tournament. The opener comes into the tournament in some sort of form, having top scored in PNG’s warm-up game against West Indies – admittedly with a score of 22 in a team total of just 105 – and the platforms he lays at the top of the order will be vital if his side are to challenge at this competition. For a 17-year-old, Milton Shumba already has plenty of experience. He made his senior Zimbabwe debut aged just 15 in the semi-final of the Africa T20 Cup against Eastern Province, and scored a fifty on his first-class debut for Rising Stars, against an attack containing three Test bowlers. He was also part of the squad for the 2016 ICC Under 19 Cricket World Cup, but didn’t bat in his only game. Watch out for a much bigger impact this time. 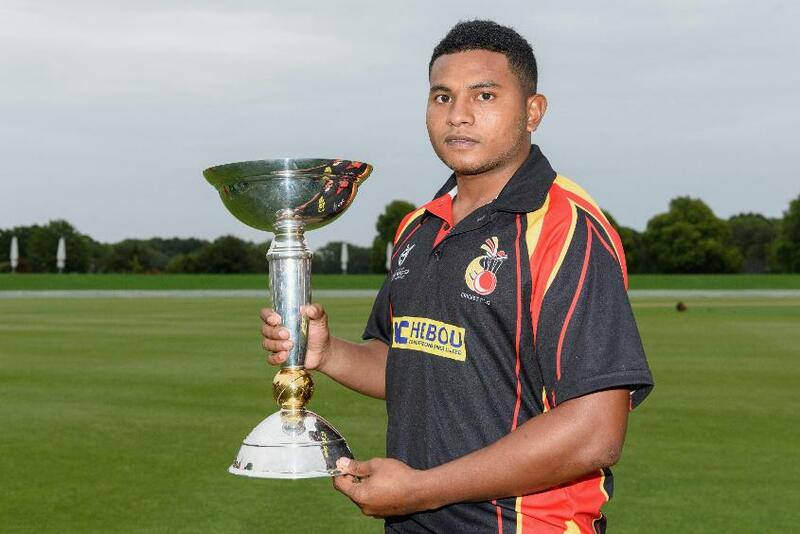 Zimbabwe U19 captain Vagi Karaho poses with the 2018 ICC Under 19 Cricket World Cup trophy. This will be PNG’s eighth Under 19 World Cup appearance, with their most recent coming in 2014, but they have never made the quarter-finals with a best finish of 12th in the 2008 and 2010 editions. The 2012 competition saw the first – and to date only – century made by a PNG batsman at this level, as Christopher Kent scored 105 not out against Afghanistan. Zimbabwe have appeared at all 10 tournaments since its reintroduction in 1998, with a best finish of 6th in 2004. They finished 10th at the most recent competition. Some notable individual performers include Mluleki Nkala in the 1998 edition, who was the joint-leading wicket taker, Tinashe Panyangara, who took the second-best figures of the tournament’s history in 2004 – 6/31 as Australia were bundled out for 73 – and Tatenda Taibu, who was Man of the Series in 2002 for his run-scoring, wicket-taking, and, when he wasn’t bowling, wicket-keeping feats. Zimbabwe and PNG have faced off in four Under 19 ODIs, with Zimbabwe winning the first three of those. The fourth however, back in 2012, brought about PNG’s first win against an Under 19 Full Member side as they triumphed by 12 runs. There’s been rain around in Christchurch and Lincoln recently, with the last two days of warm-up matches falling foul of the weather. But while there might be some rain in the morning, with a delayed start a possibility, it should clear up enough to allow the game to be played to a result. Zimbabwe: Liam Roche (c), Gregory Dollar, Donald Mlambo, Tanunurwa Makoni, Jayden Schadendorf, Milton Shumba, Alistair Frost, Dion Myers, Nkosilatu Nunu, Jonathan Conolly, Wesley Madhevere, Kieran Robinson, Robert Chimhinya, Tinashe Nenhunzi, Taun Harrison. PNG: Vagi Karaho (c), Sema Kamea, Eisa Eka, James Tau, Tau Toa Nou, Nou Rarua, Igo Mahuru, Simon Atai, Leke Morea, Kevau Tau, Heagi Toua, Daure Aiga, Ovia Sam, Sinaka Arua, Boge Arua.